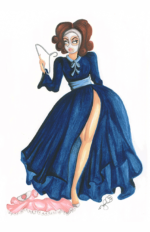 All shows Dirty Teacup Designs attends are the best opportunities to meet the creator & artist, Meghan O’Connell & to buy original art prints, greeting cards, framed artwork, pins & originals of her work. This Friday, October the 10th Dirty Teacup Designs will be at 2nd Friday Night Out from 6-10pm on Main st. in Mesa, between McDonald & Robson! 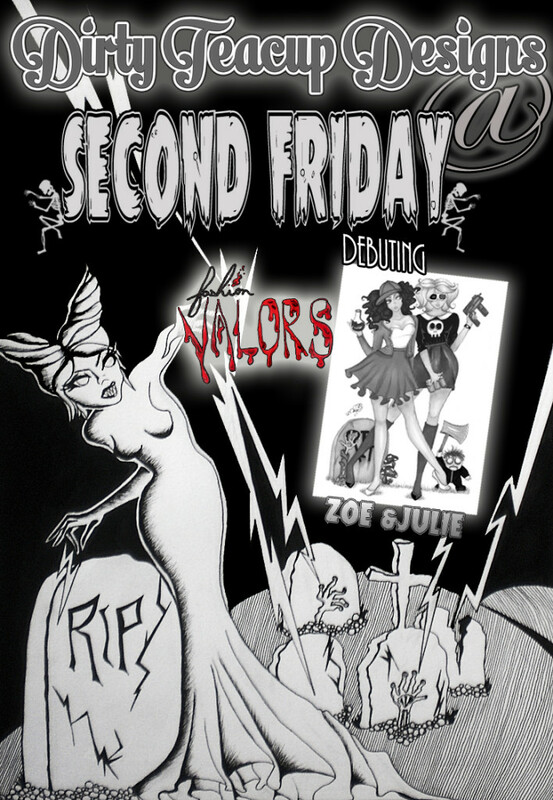 There will be a Haunted Basement tour, a costume contest & I’ll be debuting the newest piece of my Fashion Valors collection: Zoe & Julie – They are based off one of, if not my all-time, favorite videogames; Zombies Ate My Neighbors! 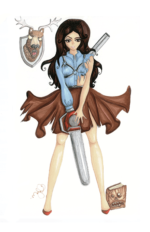 Zoe & Julie will be available as greeting cards, as well as 8×10 prints. 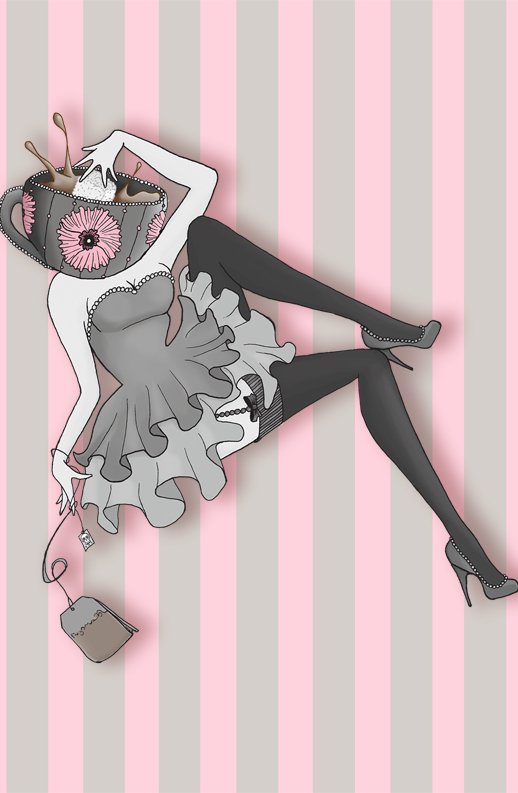 October is the perfect time of year to give that special little odd ball in your life one of my Fashion Villains cards so if you can’t make it to this event, check them out in the Dirty Teacup shop! This Friday, October 3rd, is First Friday Art Walk in Phoenix! Dirty Teacup Designs will be there from 6-10PM with a decked out Halloween display & be debuting the newest Hallows’ Eve themed Domestic Bliss piece featuring all three of the current murderesses: Claudia, Mathilda & Katia! First Fridays are always such a pleasure & Octobers’ Halloween Art Walk is sure to be a grand one! The Return of Dirty Teacup Designs! After an itsy bitsy summer hiatus (by hiatus I mean the irrational fear I have of getting sunburned the moment I stand outside – perhaps I’ll add this to my Phobias Collection? ), Dirty Teacup Designs rambunctiously returned to First Fridays outside of Revolver Records & Second Friday Night Out in Mesa! I honestly felt right back at home, where I belong. 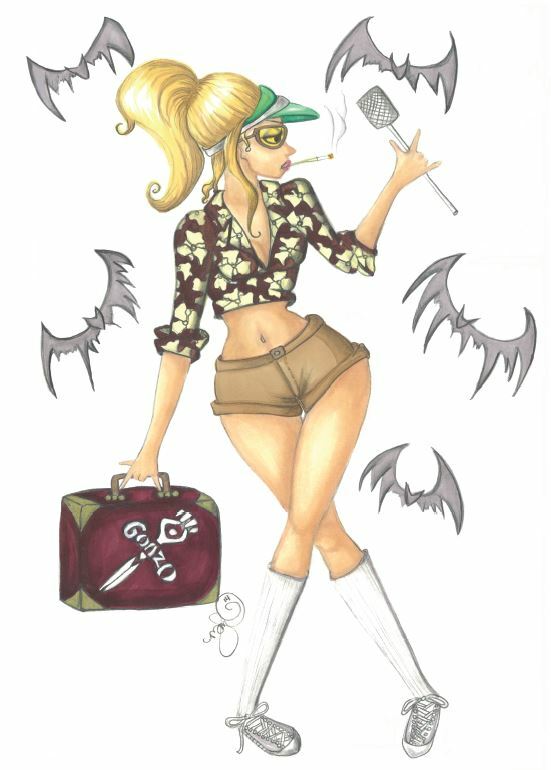 Leaping aboard my train of art prints for the very first time were Heather S. Thompson, Alice Hill In Silent Wonderland & lastly, my mascot & and first concept I ever created for Dirty Teacup Designs, The Dirty Teacup Girl. She was designed to evoke mischief blended with delicate femininity. Her mind is poisoned with ominous ideas (in this case, a poisoned tea bag!). If you couldn’t make your way to either of these events, you can get your hands on them here. The whirlwind that is Phoenix Comicon has come to pass and, although by the end I fell a tad bit ill, it just so happened to be the personal best show Dirty Teacup Designs has been a part of EVER! I debuted a plethora of new things, starting with an entirely new setup! It took a lengthy amount of time to get it just right – but in the end I thought it turned out beautifully. My brand new “Katia’s Domestic Bliss” banner with my handy dandy Ivan skeleton (Fun fact: he is the fella in the ground underneath Katia, complete with a handmade bowtie by yours truly). The newest installment of the “Phobia” collection, “Bdellophobia“, made its first appearance as well. I’m fairly certain she has taken “Mathilda’s Domestic Bliss'” crown as ruler of the raised eyebrows & terrified glances given by passers-by. So congratulations to Bdellophobia, she made me proud. Those cringing looks couldn’t bring a larger smile to my face. Ashlee Williams complete with the Necronomicon, and a mounted deer head with a serious case of the giggles. 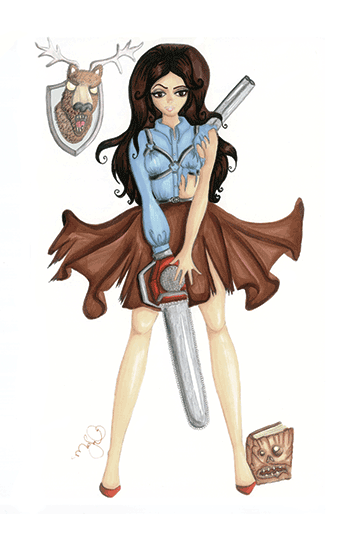 The Valors collection will feature all the “heroic” characters from my favorite horror films & videogames. I’m so happy with how she came out & I can’t wait to show you which Valor is next! My “Snow White & the Seven Plastic Surgeons” comic also came to fruition for Phoenix Comicon. It’s a tale I have had tucked away for a handful of years & I thought this would be the perfect time to bring it to life. “Snow White & the Seven Plastic Surgeons” is one of my earliest pieces from when I began to dive into sequential art. The satirical nature of beauty in society is one that resonates a lot with me & with a great many others it seems. The comic also contains two additional stories of mine, including the misadventures of a goat go-go dancer & a space ninja venturing off to a planet made of candy. 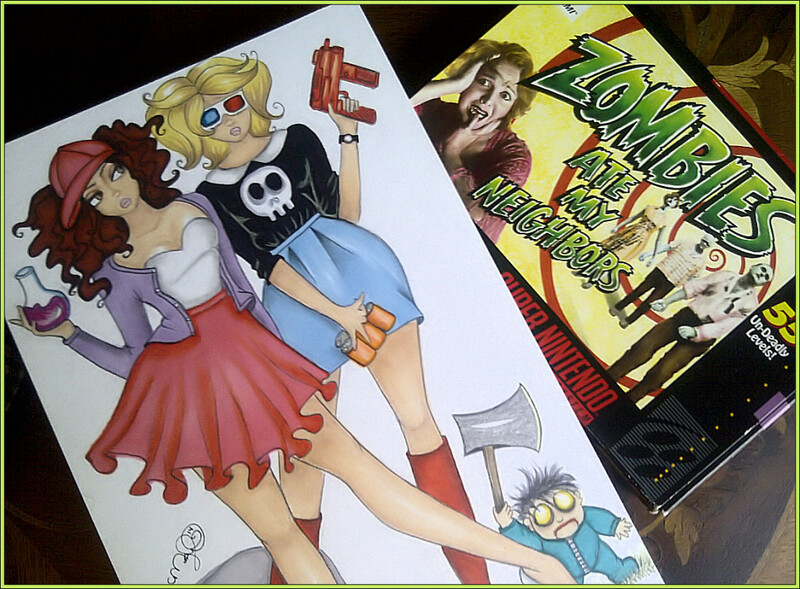 Earlier this year, I was lucky enough to be a part of Bianca Thompson’s Dead Divas/Unstoppable Cards sketch card set! I thought making some mini prints of a few of the cards I made from the set would fit nicely at PCC. Although all the characters were so fun to recreate, Lady of the Death was one of my favorite to illustrate. The best thing about enormous show like this that are filled to the brim with 77k+ people, is being able to share my art with so many people. Their reactions, praise, critiques & stories of what they see when looking at my art, make all the long, yet enjoyable hours I put into creating meaningful pieces so worth bringing them to the public. I spent so many years keeping my art to myself, and its wonderful having people that love my work as much as I love bringing all of them to life. Next stop will be Amazing Las Vegas Comicon, June 20th-22nd! See you soon, creeps! First Friday, Free Comic Book Day, and Star Wars Day! This past weekend was gloriously jam-packed with events. Despite the frenetic nature of all the affairs being scattered around Arizona. Certainly goes without saying it was all so rewarding, as a girl just trying to spread her art to the masses. Arnold was exhausted by the end of it all. As some of you may or may not know – Arnold is my teacup lounging dapper skeleton that follows me to every event I wander to – The Dirty Teacup Designs mascot, if you will. It all began with First Friday, outside of Revolver Records. 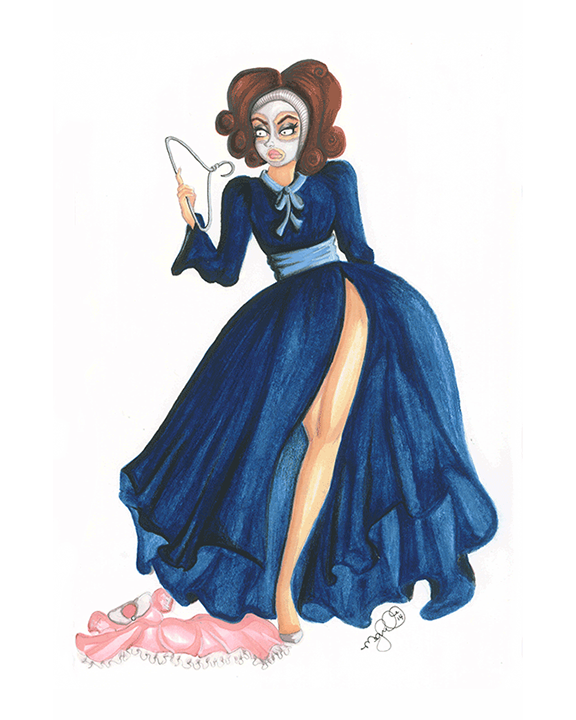 I debuted my newest Fashion Villain greeting card, Mommie Dearest – Just in time for Mother’s Day! I believe I succeeded in depicting Joan Crawford’s abusive antics in and even more glamorous way than she did herself. Next up was Free Comic Book Day at Pop Culture Paradise in Tempe. The store was full of energy & happily packed like sardines full of people ready to dive into their free comic books! I got to sell with some of my favorite local artists & met quite a few fans of my Fashion Villain cards, which really made me smile. PCP is gracious enough to allow me to display all of my murderesses in their shop! And finally was Pop Culture Paradise’s “May the Fourth Be With You” event at their Phoenix location. Perfect way to close out the weekend. I revealed my newest Limited Edition print, “AT-ATEABAG” – Because really, what’s an AT-AT to do when it gets tangled up by a snow speeder? Be used as a teabag of course! Other features include a polite tea-drinking Wampa & a random giant teacup in Hoth. All in all, I had a splendid time. I so appreciate being a part of all these local happenings. Thanks ever so much to those who I got to meet for the first time and those that participated. This will also be one of the last times I will have my setup the way it is currently. New display elements abound!